We had an amazing time! Great way to start off our romantic vacation. We were able to grill out every night and enjoyed the firepit for S'mores :) Loved being able to soak in the hottub after long hikes through the national park. Perfect place for our vacation. Kelly was great to work with and exceeded all of our expectations. Beautiful house with excellent views. Great supplies, linens and kitchen utensils. Thanks for the bag of ice on arrival. It was an honor being the first guests at your cabin. The views were incredible and the cabin was so nice and exceeded our expectations! We went to Clingmans's dome and got to experience snow We enjoyed the flea markets, shopping and the mile-high bridge on grandfather mountain. Thank you so much for the wine, extra linens and towels and the great service you provided!!!. We will definitely be back again. What an incredible week!! This place felt like home to us. The view is breathtaking and the home is decorated beautifully. Thank you for opening your home to us. We even had an Engagement proposal while we were here. We arrived so late in the date but when walked into the cabin it was such a relief! So cozy and homey. The kitchen and hot tub was great! The Smoky Mountains were beautiful even though it was a relativity gloomy weather while we were here. The pillows were so wonderfully comfy. We will be back soon. Being able to hear the river from the deck was amazing as well. We had an amazing time in your beautiful little cabin. It was very cozy and very well kept. Every day this week was a new adventure. We were able to relax and unwind. We made smores in the outdoor fireplace and the hot tub was really fun. Our Vacation was amazing and we hope to return here some day. Thank you. My husband and I had a truly enjoyable stay in the cabin. The views and quiet atmosphere are absolutely amazing. All we wanted was to relax and enjoy our surroundings. Dream catcher is a lovely place to stay and we cannot wait to visit again. What a great trip!! It is so worth it to drive from Florida. We hiked everyday, did snow tubing, mining and the hot tub. Just to name a few. One of the best New Years stay, so comfortable. Cabin had such great dcor. We got to the cabin late and instantly feel in love with the cabin. The layout made it extremely cozy and relaxing. We drove the tail of the dragon our way to visit family in TN. The next day the family came to visit us and we went and ate at the Iron Skillet and took our daughter on the Polar Express which she loved. We also enjoyed some days just staying at the cabin and exploring, playing board games, or watching TV in her "private room". Thank you for letting us stay in your beautiful cabins and celebrate the new year. What a beautiful retreat. We had a great time and the views were amazing. The cabin was perfect and cozy. We hope to be back soon. Quiet hideout for my birthday and our anniversary. Our 5th anniversary was very special. It was great to be close to my son and his family and share New Years Day together. The hot tub in the cold was pretty cool and a first for us. We had fun and can't wait to return. We had a great time in this beautiful cabin. The view was by far the best we have had when visiting the mountains. We visited in Ashville for a day, tube world and walked the streets of Bryson City. The local shops were great. We cooked great meals, laughed over games of pool and watched the Carolina Panthers win there wild card game. Thank you for a wonderful time. Quiet Hideout for my birthday and our Anniversary. Our 5th anniversary was very special! It was great to be close to my son and his family and share New Years day with them. They were impressed with the location. We were all in awe of the road!!! One lane roads in these step hills kept us here the whole mini vacation. The hot tub in the cold was pretty cool and a first for us!. We had fun!! They are very helpful ! That was an awesome experience ! The cabin was what we expected. Everything in the cabin is pretty clean and its a gorgeous place to stay in! We enjoyed every second in the cabin! Super friendly and exceptionally knowledgeable on directions when I called for assistance. We spent Christmas week in Big Oaks Pointe, and never had a better Christmas. My children are 10/12 and had so much to see and do. NEVER heard Im bored! We are already planning our next trip!! 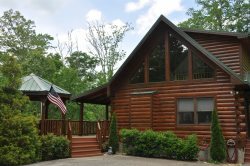 The employee we worked with was very knowledgeable about the cabin. The directions were terrific, and the details of when,and how to arrive was excellent. The employee made me feel my family was important, and that our vacation would be a memorable one. Excellent details and quick response to questions. We felt like we were at home!! The eight of us enjoyed the views, the beauty of the mountains,and the privacy the cabin offered. There was everything we needed to make it feel like our home! The location was perfect to relax, and close enough to enjoy the town shops and restaurants. Picked our own Christmas tree, + went Hiking, tubing, polar express, dining, shopping. Lovely. Great view. Very comfortable. Could see the Milky Way with the lights turned off. Very easy to deal with, professional and very nice staff. Was a pleasant stay. The surrounding was very nice -- almost on top of the mountain, very tranquil place and the cabin was beyond our expectation. The staff was very friendly, Kathy the person that helped me with the reservation gave me the tools to access the cabin in detail, and on our way to the cabin she helped us on the phone. I appreciate her help with the check-in. Thank you.